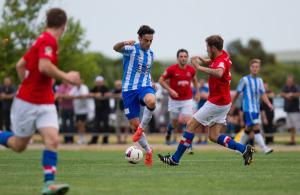 Rivals Raiders and White City played out an exciting 2-2 draw in Round 1 of theSouth Australia PlayStation4 National Premier League at the Croatian Sport Centre on Friday. The visitors took an early lead through Herman Fombason, only for Raiders to equalise thanks to Elvis Kamsoba. Nathan Fleetwood put Raiders ahead after the interval, but they were pegged back by Joseph Zawko with 15 minutes remaining. Raiders coach Carl Maynard was disappointed not to claim maximum points. “We are a bit disappointed because I thought we did more than enough to get the win and had chances to secure the points,” he said. “I was reasonably happy with how we played. I could see the improvements from last year and we knew we they would be there, but we haven’t quite gelled yet – although that should come soon. White City coach Sergio Melta was reasonably happy to pick up a point on what was his debut on the Warriors bench. “We didn’t play too well, but we got a point from it which was the most positive thing,” Melta noted. “It was a local derby and it would have been nice if we won, but in the end the conditions weren’t too favourable for the players. Overall we didn’t lose and that’s positive. Both sides had chances. It was a frantic opening as Kamsoba struck the woodwork for Raiders in the opening seconds. Yet it was White City who opened their season account with only four minutes on the clock. Fombason intercepted an errant backpass and slotted home. Kamsoba ensured the two sides would go in level at the interval when he finished past Toshihiro Hara after running through on goal. The No 10 was again involved as Raiders took the lead just before the hour mark. Kamsoba’s cross was met by Fleetwood, who finished well on the edge of the penalty area. Yet the Warriors grabbed an equaliser of their own. Zawko found enough space on the end of a flowing move to put a shot past Deale Chamberlain in the Raiders goal.